Joseph Benzola views his music as being psychedelic. He's well aware that it's nowhere near to being acid rock, but he does feel strongly that the music is mind expanding. With a background that runs from the Beatles through the most innovative of jazz masters like Sun Ra, Coltrane, and Miles, and on to rock iconoclasts like Beefheart and Zappa, Benzola synthesizes all his influences to produce music that rarely sounds identifiably like any of them... even when - as we shall see - he is paying tribute to them. For spacerockers there is much to be enjoyed here. Yes, Benzola's music is rooted in jazz, but there is nothing standard about it. Much of the synth work can compete on the freaky-meter with the best of Hawkwind or any of your other favorites. The music is a total solo effort with all music composed by Benzola and all keyboards and percussion performed by himself. Benzola's first album, "Reflections", demonstrates his proficiency and creative use of both keyboards and percussion with equal billing given to both. "Undercurrent" and the title track, "Reflections", both feature a manic combination of percussion and keys. "Undercurrent" gives the feeling of a 4-alarm fire with engines racing off to the scene. This is not music to relax by. So much is happening simultaneously between percussion and keys that the listener is coerced into a state of wide-eyed alertness. But the reward for this vigilance is an enjoyable aural assault from multiple layers of intricate percussion and competing synths that makes it crystal clear what Benzola means in his interpretation of psychedelia. "Dreams Of Ladakh", "Entropy", and "Hymn" are instrumentally simpler than these other tracks, being more like true duets between a single keyboard and drummer. "Dreams Of Ladakh" is my favorite of the three featuring a high-pitched keyboard melody played against a jazzy fast-paced drum kit. I like the contrast on this tune between the freeform quirky keyboard style and the somewhat more even tempo of the drumming. "Pembi Mirui" introduces the African rhythms that play such an important role in Benzola's music. A flute plays against wild tribal rhythms and the variety of percussion makes this sound like an entire ensemble of musicians. Finally, "Blues For South Africa" closes the album. It's an impressive solo piano piece that exhibits Benzola's ability to command the keys as well as percussion. This is indeed a bluesy composition but is played with the same rapid and continually changing tempos as the other tracks on this disc. On his second release, "Serenity", Benzola explores more avant electronic territory to create music that is often meditative, but is also deeply in the avant space realm. Spacerock fans who enjoy freaked out sound assaults will love "Motion", "Visionary States", and "Sound & Density", the last two being my favorite tracks on this disc and reminiscent of Sun Ra's wilder efforts. "Motion" sees Benzola heading deep into the orchestral space realm in which an aggressive space synth is accompanied by an avant orchestra. "Visionary States" is a wonderfully freaky space track. A sampled voice talks about spiritual practices as various synth and percussion sounds dance about. There is a steady pulsation throughout the track that is a bit brain jarring. The sound assault is constant and ever-changing making this the sonic equivalent of a meteor shower, and at nearly ten minutes it has plenty of time to stretch out and explore. "Sound & Density" is similar to "Visionary States" but faster paced and with a more symphonic edge. The same multi-layered freakout sound attack from "Visionary States" is present but is all the more unsettling as the tempo changes are more abrupt and start/stop. But "Serenity" has its meditative moments as well. Among the highlights are the title track with its slow-paced oriental feel, like electronic geisha music. "Bodhidharma" opens with two flutes sounding the call. It soon becomes a percussion piece but unlike that heard on "Reflections". Benzola excels at using percussion as a lead instrument; an instrument that can handle melody and theme development on its own, and indeed this is part of his goal. "Yearning: Fallen Tear" is a melodic, but somewhat minimalist keyboard piece. Numerous melody lines parallel each other, some changing and some repetitive. The music is peaceful but the melodies create a odd contrast and even dissonance in harmony with one another. On the one hand simplistic, but on the other a challenge to find the right combination of such different melody lines. Finally, "Visionary States - Reprise" closes the disc with the chaotic synths of "Visionary States", but in this instance it has a calmer, contemplative mood. A fitting close. Benzola's third released, "The Third Ear", focuses on mood and atmosphere. Like "Serenity", it's more keyboard dominated including solo piano pieces, though with more percussion than "Serenity" had. The music is mostly dark and intense throughout, played at often frenzied paces but simultaneously showcasing Benzola's talents as a composer and piano player. "Meditations" features a symphony of bells, gongs, and synths, and while it may be titled "Meditations" this is an intense piece of music. The accompanying choral chants are angelic but dark, and the music develops only slightly across its 10+ minutes choosing instead to work within a single theme. "Dance #1" is similar to "Meditations" but played at a frantic pace and includes more percussion. Benzola's playing is like a maddened Phantom of the Opera on bells with a barely audible droning synth line in the background. Piano is featured prominently on this disc as heard on "Shadows Of A Dead Lover", and the solo piano tracks "Dream Landscape" and "Dance #2". On "Shadows Of A Dead Lover" the mood becomes quieter but still dark and intense. Dual pianos lead the tune with one playing a dissonant melody line. There is still an orchestral feel as the dark angel choir is harmonizing in the background. Benzola roams around the keyboard alternating between slow tempos, frenzied runs, and quirky paces that are everywhere at once. A great atmospheric piece that also showcases his ivory tickling talents. On "A Tragedy", a sampled robotic voice is accompanied by spacey, almost Caribbean percussion. Like "Shadows..." there is wild piano work and when the piano, synths, and percussion hit the highway together, the ride gets treacherous. "Dream Landscape" is a solo piano piece that plays a somber melody. Things move along slowly and peacefully, but a Benzola trademark is his inability to keep from making sudden turns into different territories, typically changing the pace at which he's playing. This, of course, keeps the music interesting and the listener on his/her toes. I particularly like the slightly dissonant chords and melodies. At over 12 minutes "Dream Landscape" is a solo symphony that runs the gamut of moods and emotions. One of my favorite tracks on "The Third Ear". "Dance #2" is another solo piano piece that features very nice playing but didn't grab me by the throat like "Dream Landscape" did. In a complete turn from the previous tracks, "A Tragedy-Alternative Mix" ends the CD on a total space note. A techno beat functions as the base for loads of spaced out sound samples. The whole piece is wonderfully freaky and demonstrates that Benzola can trip out with the best of them. Benzola's fourth outing, "The Sound Of One Hand Clapping", includes the 8-part title track, and "Portraits Of The Dead", Benzola's tribute to several musicians and composers who have influenced him. This album is my favorite of Benzola's four releases. As on "Reflections", percussion plays a role equal to the keyboards but takes percussion a step further in being instrumentation that can handle entire pieces in a solo role. The disc opens with wailing Eastern sounding horns and gongs, and sparse percussion. The percussion soon takes over in force laying down rapid fire African sounds and rhythms, and is soon joined by an equally wild flute. Throughout the track's eight parts the percussion reigns supreme and Benzola explores the cosmos via jazz and African roots. 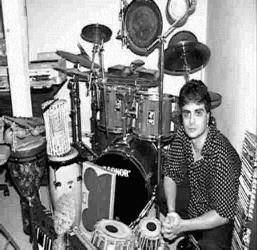 The rhythms shift continually and Benzola must have an arsenal of percussion equipment. A true symphony composed for and played by things to be hit, banged, and clanged. On "Portraits Of The Dead", Benzola pays tribute to specific musicians and composers, few of whom the music attempts to sound like. On "Kurt & Jaco Are Dancing In Heaven" the music sounds like Sun Ra in his most experimental days, especially the synths. But this is accompanied by numerous keyboard and synth layers, some of which indeed sound heavenly, but the synths are pure freakiness demonstrating that between heaven and Earth is infinite space. As it continues the music segues from the heavenly space feel into a droning industrial space sound. The "Sun Ra" track is indeed a total Sun Ra freakout! This is the closest Benzola comes to sounding like one of his influences. Pull out your Concert For Comet Kohoutek discs and listen to the keyboard sounds Benzola uses. But added to the mix is a wild pounding piano and assorted other crazed sounds making for an interesting combination and an overall fantastic ride through jazz and classical influences that get slammed through a space strainer. The remaining tracks cover Frank Zappa, Miles Davis, John Cage, Albert Ayler, Edgar Varese, and Thelonious Monk. Among the highlights are "Miles Davis" which is an African percussion and freaky synth duet. A quirky fun piece. In fact, I'm sure this is the last thing Benzola had in mind but parts of the synth bit sounds like the Benny Hill Show theme. "John Cage" is the darkest piano piece on all these discs. Synths embellish the music but for the most part this is Benzola playing like a man possessed. Very intense and not for the faint-hearted. "Ayler Weeps In Blackwell's Soul" is a fast-paced flute, horn, and percussion piece. The percussion is relentless while the horns play choppy repeated lines. Another intense tune. Finally, "Edgar Varese" is another trip into deep space with strange sounds and voice samples that sound a lot like the Residents, though far more space-oriented. In summary, spacerockers who like experimental electronic music and want to broaden their horizons should start with "Serenity" or "The Third Ear". But those of you who dig the space possibilities of jazz should go for "Reflections" or "The Sound Of One Hand Clapping". In an effort to get a bit into the Benzola musical process I spoke to Joseph one evening. AI: I looked "Amanita" up in the dictionary and I came up with poisonous mushroom. JB: It's actually a hallucinogenic mushroom. AI: Ok, that makes a little more sense. JB: The Amanita mushroom is the mushroom they show in all the fairy tales. Y'know, the red cap with the white spots. It's in every children's fairy tale. I've read a lot about various ritual use of hallucinogenic plants and have a couple good books on it. And the Latin name of that mushroom is Amanita Muscaria. So I thought that's the perfect name for a record label... Amanita Music. AI: I'm intrigued by your view of psychedelia. The idea of what constitutes mind expanding music, and transcending the traditional view of acid rock. JB: What happens a lot of times... I guess that was first used back in mid-'65 psychedelia. I guess the first bands they were talking about were the San Francisco bands. My view of psychedelic really has very little to do with using hallucinogenic drugs or a wash of guitar feedback. I think the true meaning of the word psychedelic is mind expanding. And I think a lot of music... if you're going to categorize this which I hate... but there's certain music that's for entertainment value, and other music which is used more towards enlightening and more for aesthetic value. And I think that psychedelic music in particular... the true type of psychedelic music... certainly offers mind expansion and aesthetic qualities. JB: Oh, absolutely. I love traditional psychedelic music. I love Jimi Hendrix. I grew up on the Beatles. Revolver, Sgt Pepper... I think Revolver is a much better album than even Sgt Pepper. I loved a lot of the British psychedelia such as the early Pink Floyd and bands like that. I love that music. But my whole concept behind music... there's a quote by the minimalist composer Terry Riley, he doesn't believe in keeping music in separate boxes. He thinks that music is music, good or bad, and they all kind of coexist together. Which is exactly my point of view behind music. Just because someone likes the Grateful Dead doesn't mean they couldn't like John Coltrane or The Who or whatever. But I think that people begin to categorize themselves. Y'know, I like Jimi Hendrix and I can't listen to anything else, which is kind of a stupid thing. JB: Absolutely. It's kind of funny. That whole time continuum of the 1960's was a very interesting time. Cause I think that then a lot of things were so new, and there was a lot of confluences of influences. For example, Frank Zappa, when he first came out could be considered psychedelia from San Francisco. Yet he had a thorough understanding of R&B, and certainly jazz and free jazz like Eric Dolphy. And certainly 20th Century composers such as Varese and Stockhausen. And then on the other hand you had people like The Velvet Underground who you would consider a prototype punk/grunge band. But their whole background, particularly John Cale, came from that whole fluxis movement with John Cage and Lamont Young. If you mention Lamont Young who was a "typical classical composer", a lot of his pieces with the Dream Syndicate and all was based on improvisation. He played in that band with Cale and Tony Conrad, mostly soprano saxophone which was based on the work of Coltrane and Eric Dolphy and Ornette Coleman. The whole 60's time continuum was a very interesting time because I think there were specific labels... but then there's such a cross confluence of influences in all that different music. Even jazz. You had John Coltrane who certainly was influenced by the musics of Africa and India. Now you get someone like Wynton Marsalis who has a very narrow definition of what he thinks jazz is. I think it was completely different in the 60's with music in general. AI: You mentioned Africa and India. Listening to your CD's there's parts where I really detect a... we'll call it World Music, but you know what I mean... influence as well. JB: Absolutely. My earliest influences, from what I remember, is seeing the Beatles on Ed Sullivan. And the second influence was Dizzy Gillespie. I remember my uncle used to come over to the house every Saturday. We lived in the Bronx. He used to put on this show called Like It Is. And one day Dizzy Gillespie was on and I was listening to this incredible trumpet playing and thought this was unbelievable. And he said, yeah the music is great but he's not playing correctly cause his cheeks are puffing out. And I remember saying to him, who cares! I wish I could play this badly! But I think from listening to the Beatles, and I think what the Beatles did for a lot of people is that they opened their minds to the possibilities that could be done sonically. I mean they did a lot things that today you would never get a record contract. From ballads, to typical acid rock, to a lot of sonic experiments with electronics and early synthesizers and things like that. And I think people of our generation growing up with that had a little more open mind dealing with music and art in general. So from listening to the Beatles I went on to Hendrix and various other things and certainly found John Coltrane. How I got into jazz originally was with some Miles Davis fusion albums and went backwards from there. And then after that I guess my music education mostly is from E.J. Corvettes which was out here on the East Coast. They used to carry a ton of different kinds of albums. AI: What was that, a record store? JB: Actually it's a department store. I guess you could consider it like a K-Mart or Wal-Mart for that time period. AI: I remember buying record albums in department stores. JB: It was a big thing. Being naturally curious I'd see something on Indian music and I'd go to Corvettes and they'd have it. It would be $3.99 or $2.99. It was dirt cheap. So on my paper route salary I was able to pick up all these albums. On the Nonesuch label in particular. Whether it was Indian music or Gamelon music or African music. I began to study that from albums. And I also began to pick up on the 20th Century composers from Nonesuch, such as Cage and Stockhausen and Elliot Carter. I would just buy about 10 or 15 albums a week and most of them were $2.99. So I would say in answer to your question my biggest influence probably as a musician is definitely from the jazz idiom, and also the musics of Africa and India and Indonesia, and also studying the electronic music of Cage, Stockhausen, Varese, and people like that. AI: And to tie it in with your view of psychedelia, even in pure psychedelia you're going to find Indian and Middle Eastern influences and such. AI: Are you a self-taught musician? JB: I studied drums and percussion for about 8 or 9 years. But I knew it wasn't going to go too far because I knew exactly where my music was going to be heading. I remember one time going to a drum lesson and I wanted to learn a certain thing, and he kind of just blew it off and he hands me this chart... it's the Doors "Light My Fire" with the whole drum part spec'ed out. So I said, why bother?... it's the same god damned rhythm going throughout the entire piece. So I knew from that time onward I would have a very difficult time in music. AI: You seem pretty accomplished on both percussion and piano. Which do you consider your "first" instrument? JB: Well my first instrument is definitely drums and percussion. I'm self-taught on piano and keyboards in general. But drums and percussion was my major instrument. But piano actually, I would recommend that any musician learns how to play a piano cause it gives you a different perspective towards your own instrument. The piano is such an incredible instrument cause it can be played melodically and harmonically and percussively. And I think from playing the piano I've definitely learned to play more dynamically and more melodically on drums and percussion. So it helps you understand things like harmony and timbre much better as well. AI: My favorite music across these four CD's is when "equal billing", so to speak, is given to both percussion and keyboards or percussion and piano, and that's really exciting stuff I've got to say. JB: Thank-you. I definitely think it is. It takes a certain mindset to sit down and listen to solo music. Whether it's solo drums or solo piano... I think solo piano probably is much easier to listen to than solo percussion and drumming, or even solo saxophone and trumpet and things like that. But yeah, I think the pieces that probably do work best are the multi-layered pieces. AI: Are these four CD's all theme oriented? Obviously "The Sound Of One Hand Clapping" is. JB: I definitely had in mind a certain theme for "The Sound Of One Hand Clapping" and "Portraits Of The Dead". "Serenity", the pieces flow together very logically, especially the first 5 or 6. "Reflections", I had a definite idea that it was much more of a jazz oriented sound. And "The Third Ear" was partly solo acoustic piano and a lot of avant-garde electronics. So to answer your question I kind of had a definite idea behind each CD. AI: Was "The Sound Of One Hand Clapping" your tribute to a number of these musicians? JB: That would be absolutely correct. There were certain relationships in each one stylistically and to each particular composer or musician. But they're more homages and tributes than exact stylistic rip-offs I would say. AI: And as a listener, if you played this stuff for me and I knew nothing about you, I may have picked out some Sun Ra influences but it's clear you're not just paying stylistic tribute. JB: Which a lot of times does not work. But you're able to be influenced by people... it's really interesting sometimes you hear various musicians or artists in general say that they're greatly influenced by a particular person, and you either look at their work or hear their work and you say, where the hell is that coming from? JB: I would say absolutely. These CD's screw up a lot of people because I guess they're thinking about... the average CD when you buy it now from start to finish is stylistically going to be very similar. But my music... "The Sound Of One Hand Clapping"... one part of it's all solo percussion. The next one starts off with a Musique Concrete piece, into the Sun Ra tribute, into the Albert Ayler tribute. And people would think that none of this is really... it's not that it's not coherent... it's stylistically very different from piece to piece, and that's done purposely on my part. Cause getting back to my initial statement with the Terry Riley quote, I just really don't believe that music has to be kept in certain boxes. And everything influences everything. And one piece can be a solo piano piece and the next piece can be an electronic excursion. It doesn't bother me. That's how I conceive music. JB: Kurt Cobain and Jaco Pastorius. AI: How does Kurt Cobain fit in with the rest of these musicians? On the surface he would certainly seem to not fit in. JB: I look at Kurt Cobain... he was a great songwriter and I think that he got stuck in this whole thing... the King of Grunge or whatever the hell they called him... he certainly was a songwriter in the tradition of like a Neil Young or a John Lennon. The guy was a tremendous songwriter lyrically. And musically I thought he was very strong. I really thought that if he were still alive he would be writing some incredible music. And I'll never forget the day that he died. I was sitting in my friend's apartment, and on MTV they just matter of factly mentioned that Kurt Cobain was dead. And that's actually how I got the whole genesis behind that whole suite of pieces "Portraits Of The Dead". For some reason in my mind I also lumped in Jaco Pastorius even though he was a jazz bass player. They kind of both had that "punk" kind of attitude. Now looking at that music it's totally separate from the kind of music they would play. But the intent behind the piece, I had this whole thing about their souls ascending... from the Tibetan Book Of The Dead there's something called the Bardo Plane. And your soul goes through various stages to get to Bardo Plane. And if you listen to the piece fairly closely, there's definitely sounds of ascension, until you get to the last piece which is a drum section, where they've actually reached that particular sphere. AI: So is that why you've got Kurt and Jaco on the same piece, these similarities? JB: Exactly. They both died a similar gruesome death. Jaco pretty much was laid down on a railroad track and was run over by a train. And Kurt Cobain put a gun into his mouth and shot himself. AI: Tell me about your recording process. There's a lot going on here and you're doing it all yourself. Will you typically start with keyboards and do percussion over it, or vice versa? JB: It depends upon the piece. Being a drummer first a lot of times I'll lay down the drum tracks first because as I'm playing each instrument myself I know exactly where I want to go. But a lot of people's concepts of drums or percussion in general is basically just coloring effects or just laying a 4/4 rhythm. My whole concept of drumming... a lot of the material that the soloist takes... John Coltrane is a good example of this... a lot of times it was just him and Elvin [Jones] doing duets. And a lot of the thematic material that Coltrane was playing actually came from the drums. And if you study a bit of the musics of Africa and India, a lot of the information that the soloists are taking are actually done from the rhythm section on up. So a lot of times I'll have a particular idea in mind and I'll lay down the drums and rhythm first, then later the keyboards and other instruments on top of that. And other times I might just start playing something on the keyboard or one of the flutes or reed instruments and go with drums there. So it depends what I have in mind at the particular time. AI: So does it start off improvisational and end up composed? JB: All of the pieces believe it or not are based on improvisation. My strong point is not as a melodic improvisor. I basically add harmonic and rhythmic improvisation as opposed to melody. Though I think that the term melody is misused quite often. When people think of melody they immediately think of a pretty little statement. But all melody really is just the juxtaposition of notes in various sequences. AI: It's funny you should say that because as a non-musician reviewer I'll use the term melody when I hear something you could almost sing rather than something that's really constructed. JB: Right. Like if you listen to Cecil Taylor you say, well there's no melody there. Well there actually is a melody because the horn players are playing a particular line of phrasing... it might not be the easiest thing in the world but there definitely is melodic information within those pieces. And there's melodic information in my pieces as well but it's not what you would call pretty. AI: Do you ever perform live? I guess you could perform solo electronic stuff, but do you ever put a band together? JB: I don't really relish the thought of me doing all this stuff alone, but I have to do it. In my entire career as a musician I've had terrible luck with musicians. Their intent sometimes is not quite what they think it is. And when it comes to music I'm extremely serious. And a lot of times the motives involved in playing music is just on par with what I'm doing. I've been married for the last 12-13 years with two kids. I don't have time to screw around with other musicians if they're not serious enough. So that's the main reason why I developed my own studio and recorded my own stuff because I had to do it. And I knew I was not going to do it with other people. But with that said, I would love to perform live again. I'd love to perform with other people. AI: Is that how you got started though? Were you originally in bands? JB: Oh yeah. I played with many many different types of bands. I played everything from psychedelia like Hendrix, to The Who and the Beatles, to Yes and Emerson, Lake, and Palmer. I've played Be-Bop. I've played Dixieland. I've played free jazz. I've played just about everything. AI: When you were in bands were you typically a drummer or did you do keyboards as well? JB: In most bands I was with, it was all drums and percussion. AI: Do you ever return to it once in a while in the hope that you might be able to put something together? JB: I've put ads in various music magazines like the Village Voice, and the returns you get are quite strange... and you'd rent recording studio space out and nobody would show up, or they'd show up and they have no money. So it just got to the point where I said I just can't deal with this nonsense anymore. AI: What kind of keyboard equipment have you got? JB: I use one master keyboard, it's made by a company called Kawai. It's a Kawai-11. And then from that I have various sound modules. I have an Emu Vintage Keys, which are samples of Moogs and ARP's and things like that. And I have a Proteus-3, which is various ethnic and percussion instruments. I also have something called a Nord Lead, which is basically a digital-analog synthesizer. It's a sound module which is kind of set up in essence like the old ARP's and Moogs are. Plus I have various software synths such as Reality. And a great product known as Reactor which is a software synthesizer based on a PC, which emulates not only samplers but old modular systems like the old modular Moog systems and things like that. AI: You're pretty passionate in your indie ethic and views of your own music. I'm curious if that's the result of some near miss or near hit with the music-industrial complex? JB: [laughing] I've never even had close to a near hit or near miss. Because I realized very early on that the kind of music that I really loved to play and perform and compose is something that would never in a million years would get recorded. And instead of wasting my time going to studios and spending a lot of money making these demo tapes, and then their never getting performed and recorded, I decided just to do everything myself. But I know exactly what direction I want to go in. I know exactly how the music should be shaped and sound sonically. And I know how it should be recorded. I remember when I used to do some recording with other musicians. They would get the drums and get the cymbals. And I'd say, you are a recording engineer. You should be able to record the sound of the instrument that the musician wants, and that works easier for you. A lot of sound engineers are really lazy and aren't very good and they've destroyed a lot of good music. Believe it or not the four CD's are recorded on a 4-track Tascam. And then once I got all of my computer equipment, and I had the money to get a CD burner, I downloaded all of the music on the computer and completely remastered it and burned it on to CD. People would not realize that most of that stuff was recorded in the spare bedroom. AI: It looks like the CD's are pretty recent for you because looking at your promo material and web sites still mostly refer to cassette releases. JB: Right. The CD's were out middle of this Summer as a matter of fact. AI: All four of these were recorded '95-'96 so you had a flurry of activity there. Are you waiting to see how things go with those or do you have other things in the can? JB: I have right now at least another CD's worth of material. But I've been very busy making CD's and sending them out for airplay and for review. I would say that since I started doing this mid-Summer I've sent out at least 200-300 CD's. AI: Are you getting a response? JB: The best thing about the CD medium is it's much easier to get airplay if they like the music because they can find the selections that they want and don't have to scroll through a tape. So I've been getting a lot of airplay. I've been getting at least 2-4 stations a week playing things. They might only play it once but who cares, they are playing it. AI: Any final news you'd like to share? JB: The recording activity for last couple months has been kind of put on hold because I'm dealing with getting stuff out to stations and for reviews. But I would say by December or January at the latest there definitely will be a new release.